TAYABAS CITY - Jeffrey Dimailig, Teacher In Charge, presented the plans for the Tayabas City Division 2019 Brigada Eskwela Kick Off Ceremony during the State of the School Address at Mate Brgy. Hall on April 8, 2019. Approved activities and partnership support were showcased to the internal and external stakeholders including the Schools Division Superintendent, Dr. Catherine P. Talavera, CESO VI; Education Program Supervisor, Louie Fulledo; Education Program Specialist II, Joan Kathleen T. Brizuela, Brgy, Captain Johnny Sumilang, and PTA President Loreta Edora. 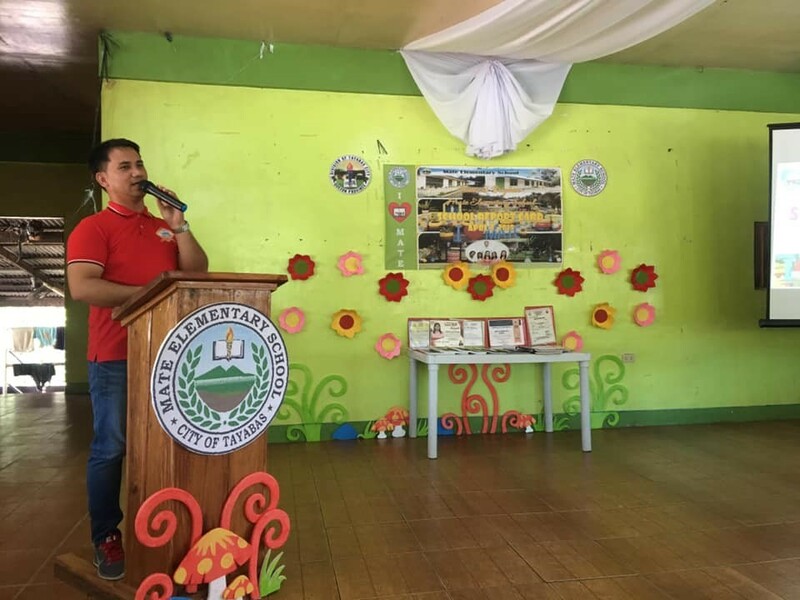 The target of the school is to have 100 volunteers per day and create a safe and conducive learning environment during 2019 Brigada Eskwela Implementation. Motorcade and kick off ceremony will be held on the morning of May 17, 2019. Motorcade route will start form the Schools Division Office of Tayabas City to town proper, Brgy. Mateuna, Brgy. Lakawan and will end at Brgy. Mate while the Kick Off Ceremony will be conducted at the Brgy. Hall of Brgy. Mate. Dr. Catherine P. Talavera emphasized on the collaborations of the school community including not just the school head, teachers, Brgy. Captain, PTA president and other stakeholders in order be a better and brighter education provider for Batang Tayabasin. Without the trust and support of the public and private partners, the strategic goal of the division to build healthy schools, effectively Implement K-12 curriculum and efficient delivery of educational services will not be actualized. Volunteers, partners and other interested stakeholders are invited to share their time, effort and talent to all the nearby schools on May 20-25 from 8am to 5pm.